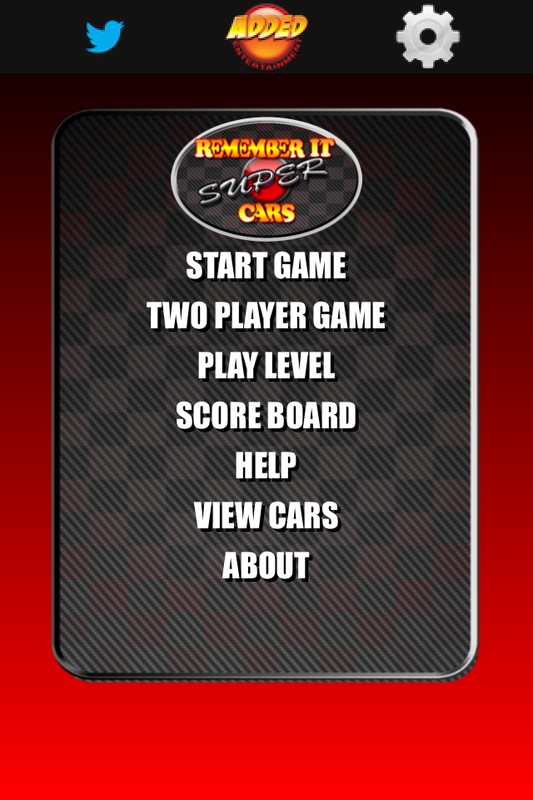 A brain training memory game featuring Super Cars. Play with friends via bluetooth. Memorize the cars to train you brain, flip the cars and match to win. 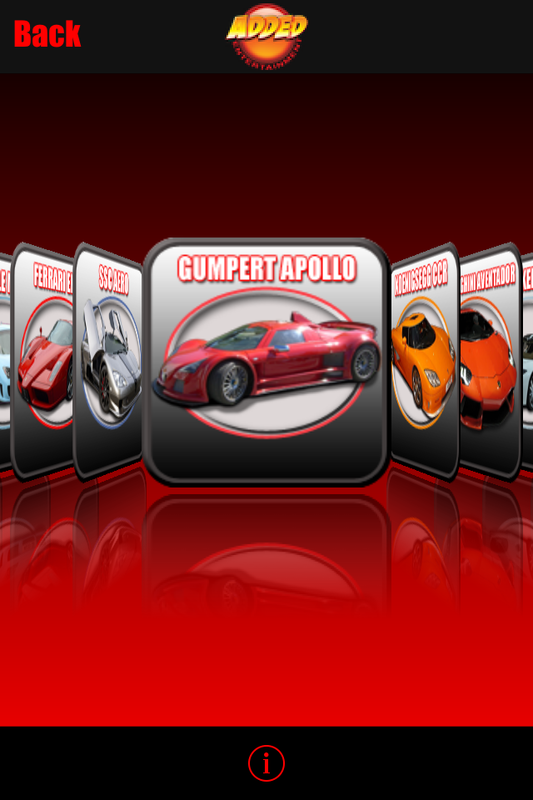 Featuring 25 levels and 18 mega super cars. View all the cars from the View Cars screen. Touch an icon/card to flipit. Remember the positions of the icons and match cars to win points. A matching pair of super cars wins 10 points a losing pair is flipped back over and loses 1 points. Match for cars in a row to gain a X2 multiplier. 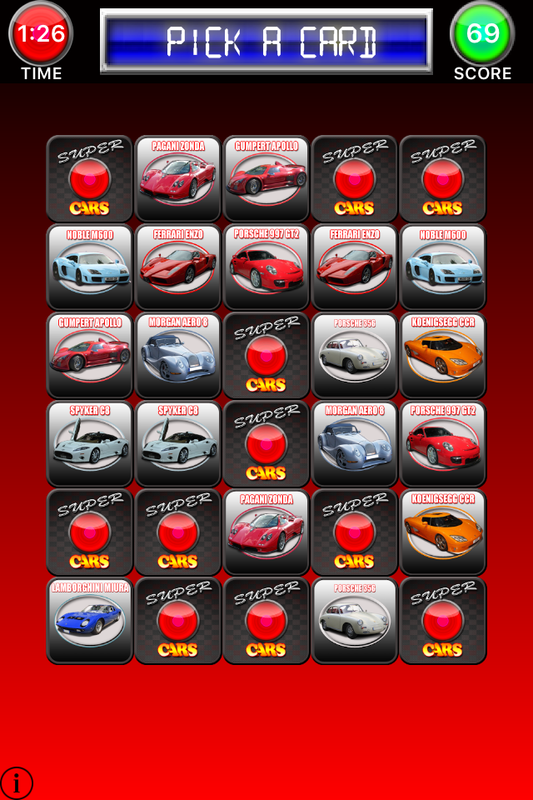 Match all the pairs of cars to complete the level. More cards are added on completion of each level. Thirty levels are available. Complete the level quickly for a Time Bonus. Three games are playable the standard game, the Two Player Bluetooth game and the single level game. Play against a friend flip the icons and match cars for points, the winner is the player with the highest score after all cards have been matched. To play two player the game must be installed on both devices. When the two player game is started you will be asked to turn on bluetooth, once bluetooth is switched on an alert will then offer you the option of starting a game or connecting to a game. On one device click start game and on the other device click connect to game, select your opponents device from the list of available devices. The game will then connect the devices to each other displaying a message box when connected. Press the info button to return to the main menu screen. Added Confetti to Score Board. Stop multiple devices showing in bluetooth connect. 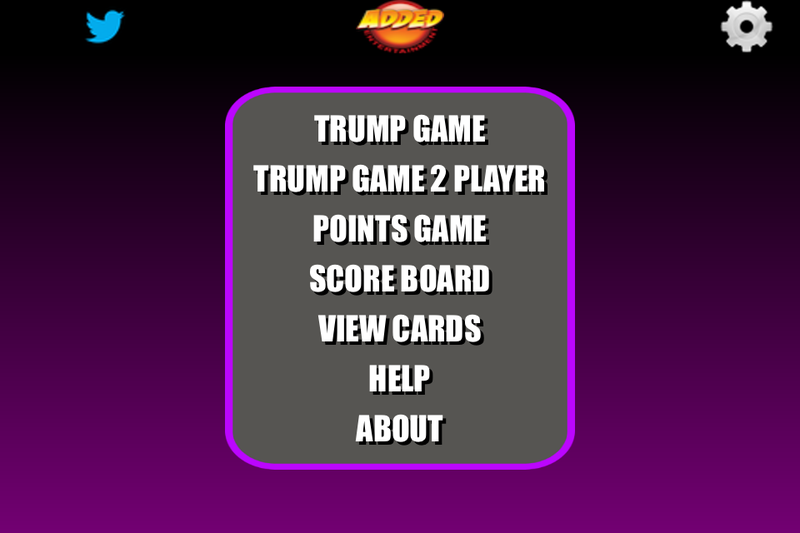 Trump It is a Trumps card game for the iphone based on the card games Quartets / Go Fish. Played with a pack of 40 mega trump cards, the aim of the game is to trump your opponent and take all his cards. 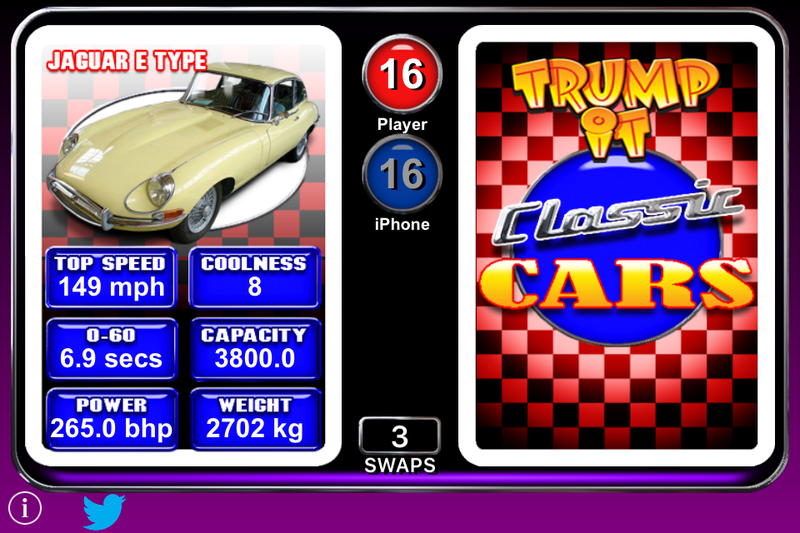 Compare cards in a race to collect all your opponents super trump cars. The weight category wins when it is the lightest, acceleration wins when it is fastest, all other categories win when they are the highest value. The player with the winning value for the category selected wins the 2 cards and places them at the bottom off their pile of cards. In the event of a draw both the cards of the player and opponent are added into the draw pot. The winner of the next round wins all of the cards in the draw pot as well as the top card from each player. The aim of the game is to win all of your opponents cards. 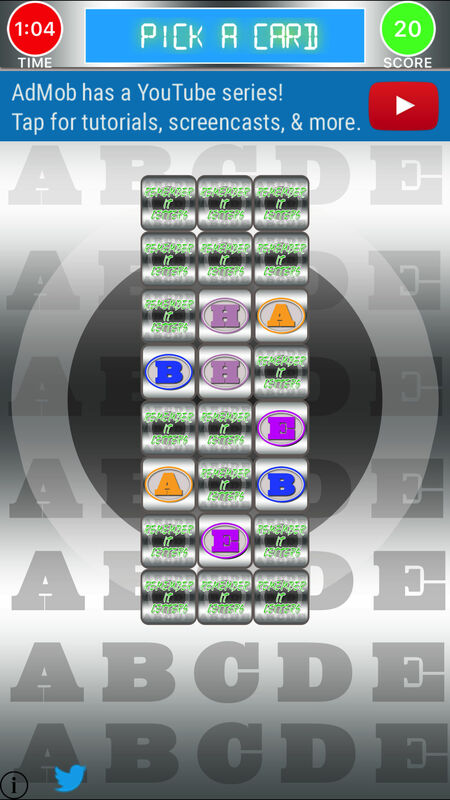 One Player - The player enters the paddock and races against the iPhone/iPod. Two Player - Two people play via bluetooth. 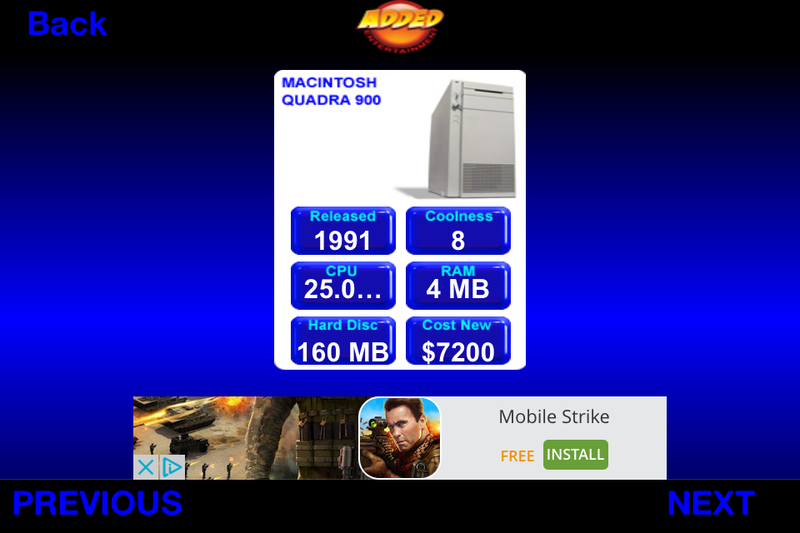 The game must be installed on both devices. The winner must trump their opponent and take all the other players cards to win. Follow the on screen instructions to connect. 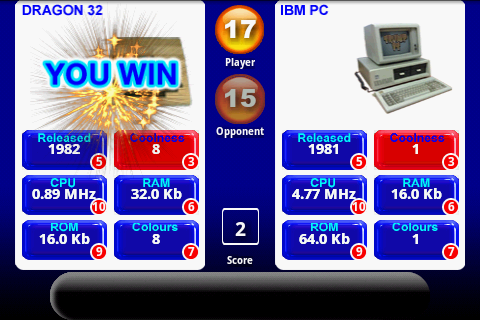 Points Game - The Player plays against the computer and is awarded points for winning dependent on the category selected. The higher the chance of winning the lower the points. To get a high score you must risk gambling on a category with a small chance of winning. Try playing for a draw as both players points are added into a draw pot, whoever wins the next hand is awarded all the points in the draw pot. Winning 5 consecutive hands will result in the available points being doubled. Losing a hand will return all points values back to their original values. Watch out for the cheat, that shows you the winning category. Shaking your phone will swap the current card only 3 shakes are available!. Stop blur flashing on high scores screen. Stop nav bar showing when returning to main menu. 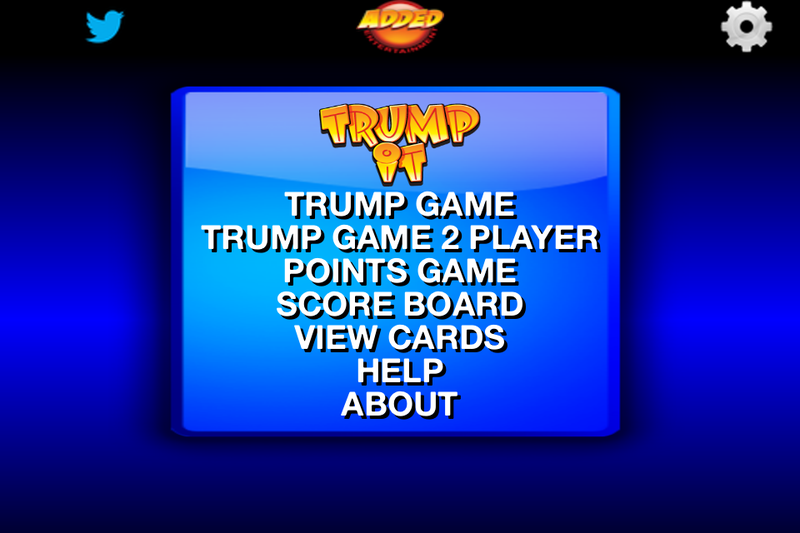 Trump it for iPhone is played with a pack of 40 cards that is shuffled and evenly dealt between 2 players. The aim of the game is to take all your opponents cards by selecting the highest value category from the 6 on your current card. The release date category wins when it is the oldest all other categories win when they are the highest. One Player - The player plays against the iPhone/iPod. Two Player - Two people play passing the iPhone/iPod between each other. 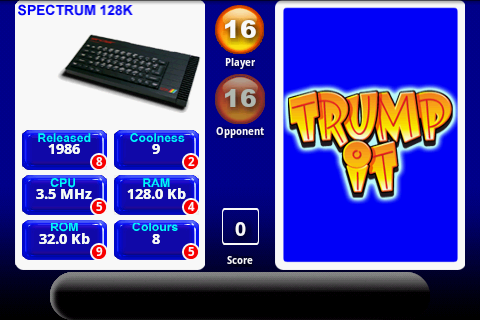 Points Game - The Player plays against the computer and is awarded points for winning dependent on the category selected. Points are displayed in the red circles next to the category buttons. The higher the chance of winning the lower the points. To get a high score you must risk gambling on a category with a small chance of winning. Try playing for a draw as both players points are added into a draw pot, whoever wins the next hand is awarded all the points in the draw pot. Winning 5 consecutive hands will result in the Points available being doubled, (the points in the red circle are doubled). Losing a hand will return all points values back to their original values.The game ends when all the computers cards have been taken. High scores are saved at the end of the game. The cards can be viewed via the view cards menu option. The user can flick through the entire pack of cards. Pressing the Info button during the main game shows the info screen which has options to turn off/on the sound and show the rules via the rules button. You can also return to the main menu screen via the menu button. A brain training memory game featuring Numbers. 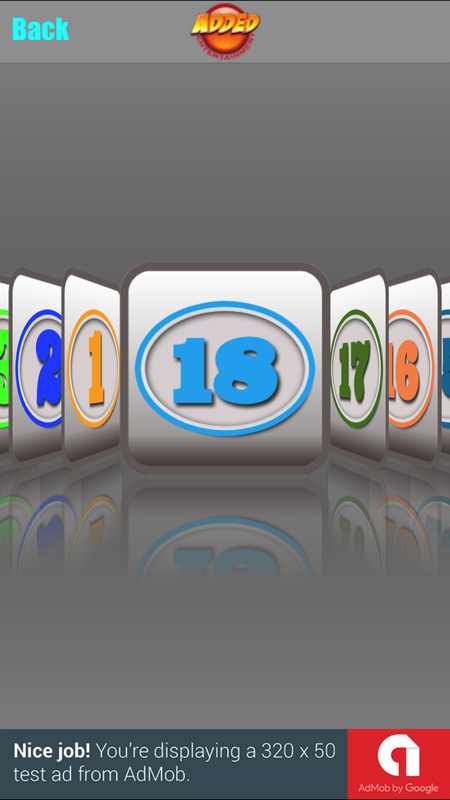 Memorise the numbers to train you brain, flip the numbers and match to win. 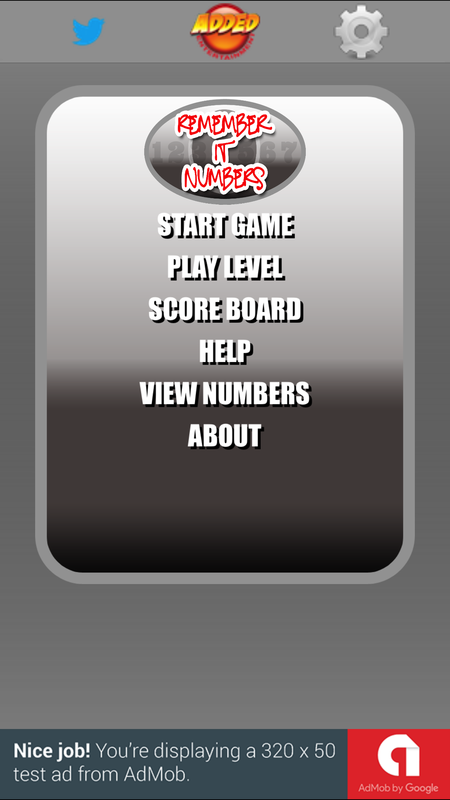 Featuring 30 levels, view all the numbers from the View numbers screen. Touch an icon/card to flipit. Remember the positions of the icons and match the numbers to win points. A matching pair of numbers wins 10 points a losing pair is flipped back over and loses 1 points. Match four numbers in a row to gain a X2 multiplier. Match all the pairs of numbers to complete the level. More cards are added on completion of each level. Thirty levels are available. Complete the level quickly for a Time Bonus. Two games are playable the standard game and the single level game. Added confetti to game over screen. Name entry added to settings screen. A brain training memory game featuring Letters. Memorise the letters to train you brain, flip the numbers and match to win. 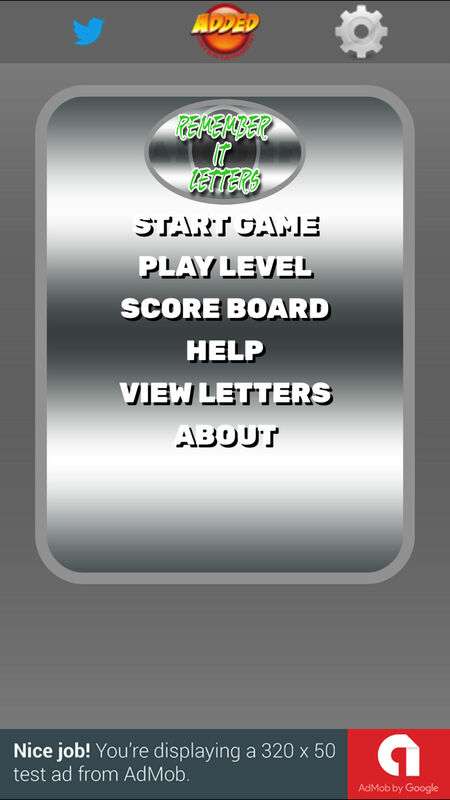 Featuring 30 levels, view all the letters from the View letters screen. Touch an icon/card to flipit. Remember the positions of the icons and match the letters to win points. A matching pair of letters wins 10 points a losing pair is flipped back over and loses 1 points. Match four numbers in a row to gain a X2 multiplier. 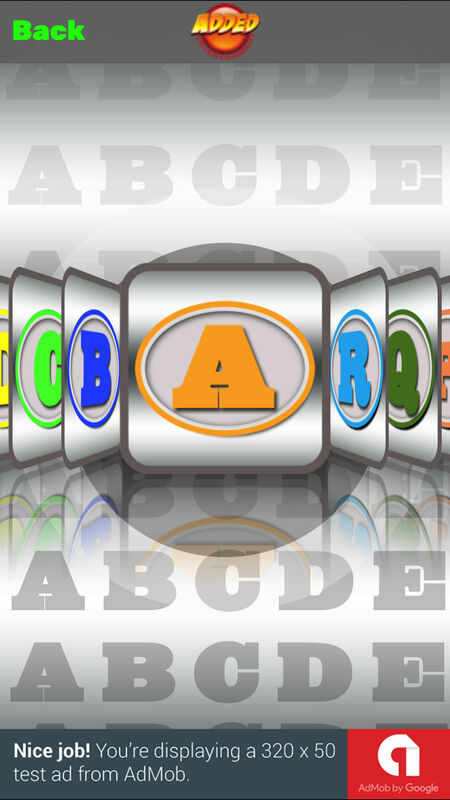 Match all the pairs of letters to complete the level. More cards are added on completion of each level. Thirty levels are available. Complete the level quickly for a Time Bonus. 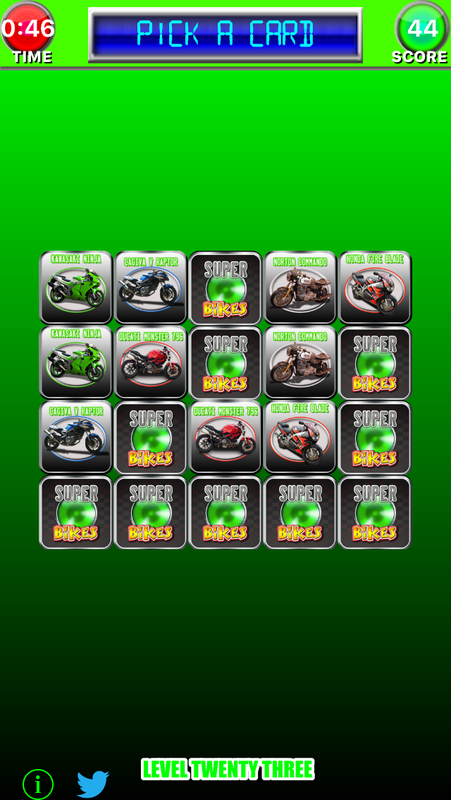 A brain training memory game featuring Super Bikes. Play with friends via bluetooth. 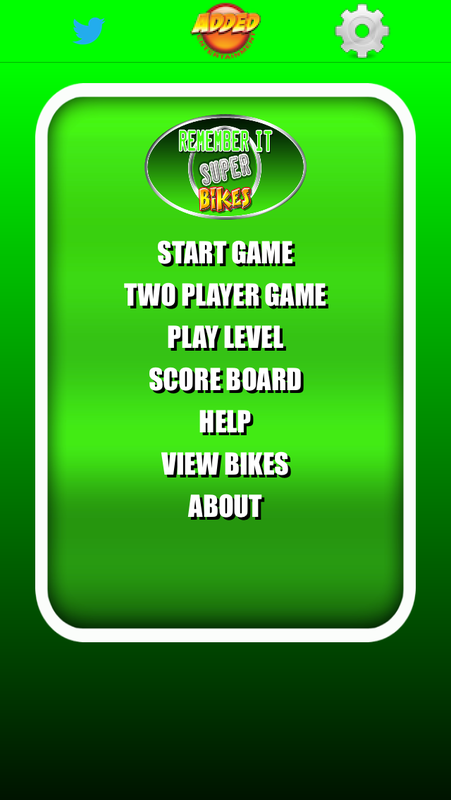 Memorise the super bikes to train you brain, flip the bikes and match to win. Touch an icon/card to flipit. 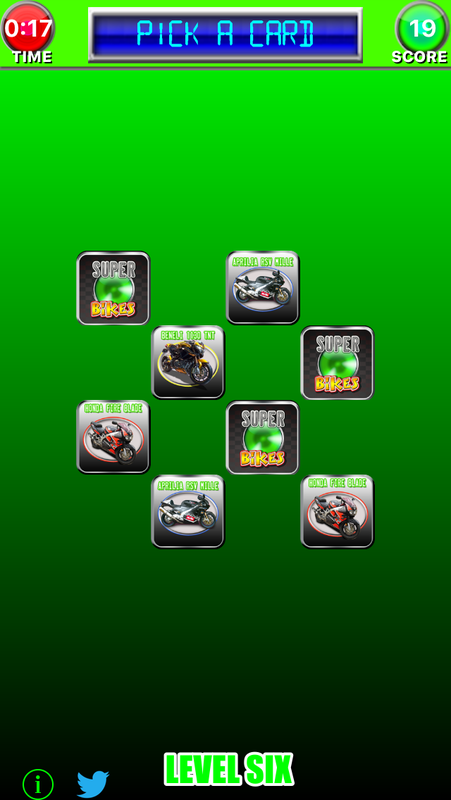 Remember the positions of the icons and match the super bikes to win points. A matching pair of letters wins 10 points a losing pair is flipped back over and loses 1 points. 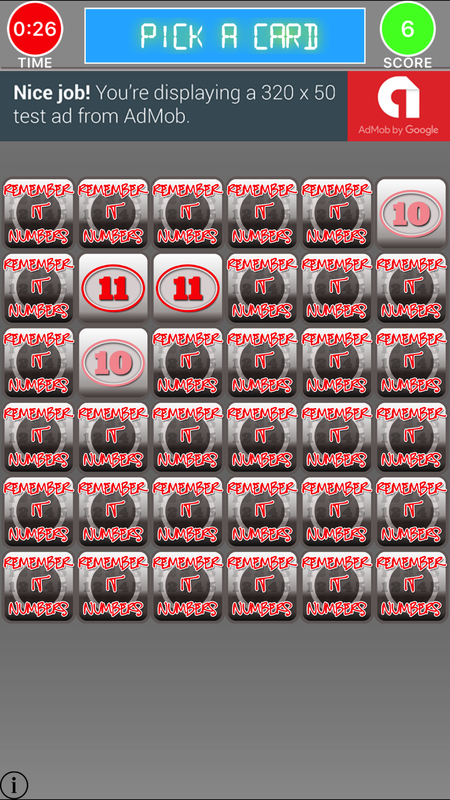 Match four numbers in a row to gain a X2 multiplier. Match all the pairs of letters to complete the level. More cards are added on completion of each level. Thirty levels are available. Complete the level quickly for a Time Bonus. 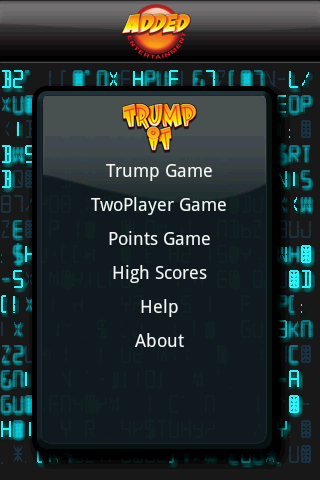 Trump it is a Trumps card game for android phones, based on the card games Quartets / Go Fish. The aim of the game is to trump your opponent and take all his cards. Trump it is played with a pack of 32 cards. The cards are all Classic Computers from the 70's and 80's. Each card has six categories each of these category contains data about the computer displayed on that card. The aim of the game is to trump your opponent and take all his cards. The player with the highest value (The Top Trump) for the category selected wins the 2 cards and places them at the bottom off their pile of cards. The release date category wins when it is the oldest, all other categories win when they are the highest value. In the event of a draw both the Cards of the player and opponent are added into the draw pot. The winner of the next round wins all of the cards in the draw pot as well as the top card from each player. The aim of the game is to win all of your opponents cards. One Player - The player plays against the computer, winning when all the computers cards have been won. Two Player - Two people play passing the phone between each other. The winner must take all the other players cards. Pressing the menu button button allows the user to return to the main menu screen or enter the settings screen where vibration and sound can be turned on/off. Updated to support more screen sizes. 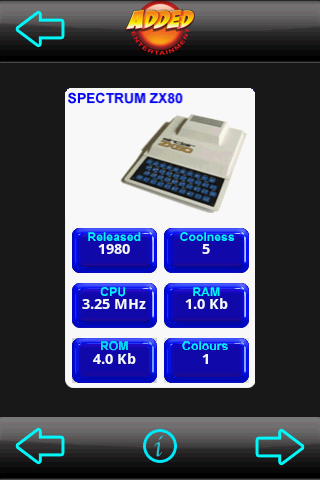 Added information button to view cards screen. The pack of cards can now be viewed via the View Cards menu option. Fixes Crash on game start on Wildfire and other devices with QVGA screens.